having a hard time finding lots of pics with dinettes. 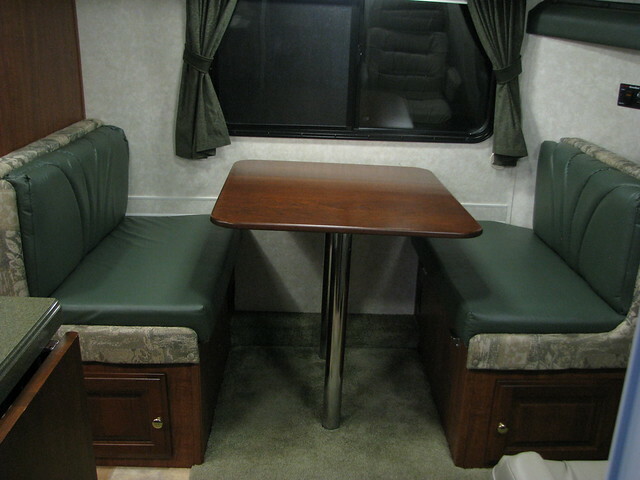 Here are some pictures of our 2350 dinette without a slideout. Being that or rig is a 2007 model, the table legs are the old design. The new design has the table attached to the wall and one leg at the opposite end. I think the table top pivots down to the "Bed" position by simply flipping up and locking the leg under the table, then the table drops down. Hopefully someone with the new design will clarify with pictures. I would like to see how it works myself. In our pictures, you see the framing is finished in cloth but the cushions are leather. This is because we originally had cloth cushions. The new dark green cushions are much more comfortable as they have more dense foam and are thinner, providing better support and more room to boot. For the 2350, the dinette inside a slideout is significantly smaller and tighter with less leg room, less head room, and a smaller table. Ron, I don't think I caught any pictures before of the new dinette seating. I love the contrast in texture and pattern/color. Great job! Made a decision, ordered the 2350 sprinter with no slide, yeah. A few changes though, Blu Ray player surround sound, 3 way fridge that is stainless steel, fantastic fan in bath, 2 fantastic vent covers, adjustable shelves in closet that can be removed, sprayer in toilet, window awning over dinette, and in dash GPS Rand McNally with back up monitor & CD, I think thats it. Can't wait we are so excited! Congrats to you both !! Our first PC in 2010 was a 2350 Sprinter(no slide) We hope you enjoy it as much as we did. Our lifestyle changed a little and we decided that we wanted to become sunbirds and leave FL for 3 or so monthes in the summer so we went with a 2011 2551; now we have a 2013 2910, which we love! Safe travels. Very nice deviations, all of them. Since you are adding removable shelves, I would consider the same for the shirt closet, the smaller hanging cabinet, just to the right of the microwave oven. I added a fixed shelf there. Maybe two adjustable shelves would be better. Also ask where the subwoofer will be mounted. I requested it go in the front most dinette bench seat and it does make most sense to put it there. Back in 2007, they placed it under the main bed where precious outdoor storage is compromised, and it's best far away from the bed when one is napping while the other is watching TV. I also highly recommend the thermal windows. I do wonder of the value of the roof antenna. If doing it over, I would request NOT to have one. With digital, it's good only if the rig stays put. It's a science project to figure out where to point it and then scan for channels, repeating the process until we give up and throw in a movie. On The Go TV is best for DVD/BlueRay movies. If you have money to burn, get a tracking satelite dish system though some people are disappointed in them too. Broadcast TV is great at private campgrounds with Cable TV service. Our rooftop antenna is nothing but an ugly roof ornament that put many holes and piles of caulk in the aerodynamic cap where it is mounted. And it rattled a lot until I felt padded it in many places. That large roof top space would be better utilized for a solar panel. Congratulations to both of you. We're sure you'll enjoy your adventures. Hope to see you in FL in the winter. I have to agree with Ron. If I had my druthers, I'd choose to dispense with the roof antenna and ladder (I don't going up the anyway). I do like the slide though. Other than that, sounds like you've got it wired (pun intended). Enjoy in good health and maybe we'll see you on the road. 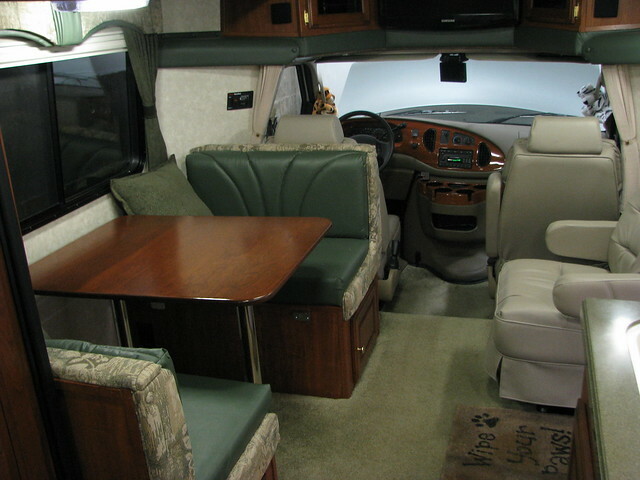 Pictures of the dinette in the 2350 slideout would be of value to those considering it. Maybe Earl will get some posted next rig coming off the line that way. Regarding our interior color scheme....It just sort-of happened that way. We liked the green interior but not dark green captian seats for fear they would clash with the gray exterior. Later we replaced the green barrel chair with the captain seat but went gray to match the other two. Then this past winter we switched the dinette cushions from cloth to leather. They ran out of original 2007 gray so green was an alternate. The cloth dinette trim (same as the original cushions) also matches the valances throughout so it's not out of place. 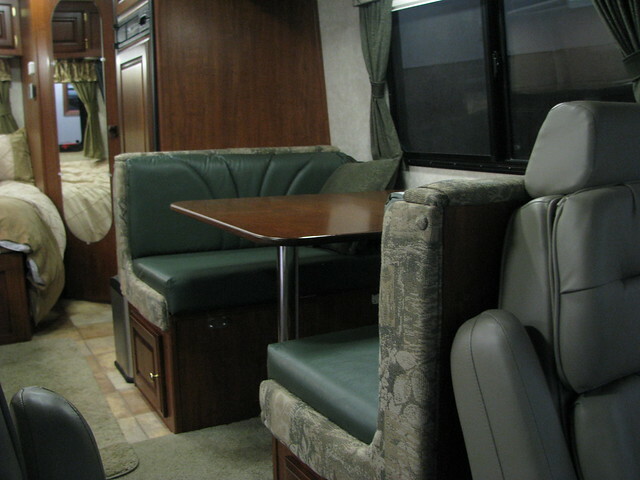 There is even some dark green vinyl in the valances which makes the dinette a perfect match. It seems the cloth trim would take a beating better than vinyl anyway. PS: I still have to get those galley drawers done before or first trip of the season. But still working crazy hours. I only need one good day to finish them. Oh Ron, B!tch, b!tch, b!tch. We leave for yet another western trip on the 25th. Grand-daughter is getting married. Grand-daughter is getting married? Ohmigosh. Am I really that old? But, thank God, not too old to enjoy this lifestyle (pre-Cancer screening shows NO markers. Pretty good since I smoke like a chimney). Another post talks about miles per gallon. I'm too embarrased to join that because we get a consistent 9.5 towing. BTW, although I'm not a big fan of green, your Phoenix looks pretty good. Whoda thunk? Lastly, I'm still waiting for pics of your new drawers (the ones in the Phoenix). Lastly (again), we'll be passing through IL on 80 - how far are you from there?). Lastly (finally), yes, I'm drinking again (hear that Jack?). 9.5 mpg with a 2552 towing is exceptional! The green interior was my wife's doing. I take no credit.....or responsibility for that matter. Regarding the mileage, I believe smoothing the airflow behind the Phoenix has something to add that wouldn't necessarily happen if it was a regular cabover Class C. That and I drive pretty easy, seldom seeing more than 65. Work the time while you can (and while you're healthy). Just picking up our new to us 2010 2551 tomorrow. We are leaving a class A Winnebago and this should be a size challenge for me. Where does everybody put a garbage can? Will have lots more questions soon. 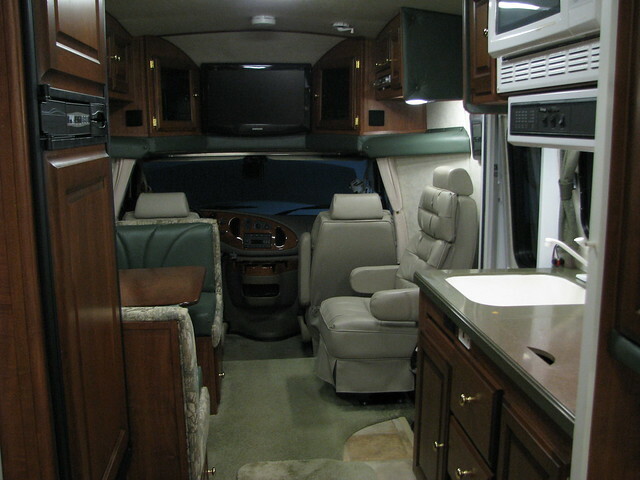 I am a brand new RV-er and I am in the process of purchasing a 2007 PC 2551. The inside is like new and it only has 13,500 or so miles on it. I had to drive 344 miles to see it and check it out and it should be ready in a week or so. I would like to know if I can get an owner's manual for it. Since I am new to it I have been devouring everything I can on line to learn about the ins and outs of how things work and what maintenance I should be doing, etc. For instance, for the fresh water tanks, add a proper amount of bleach, run the faucets one at a time until I smell the bleach, then drain the tank, put fresh water back in and run the faucets until bleach can no longer be detected in the faucets. The instructions I saw said to use a quarter cup of bleach per 10 gallons, I think. Is there any where I can go to get all of these maintenance tips in one spot or do I just have to find my way around system by system? I'm looking forward to being able to participate with the forum and hope soon I won't have just questions but can contribute my experiences also as I am headed north for the summer! Going to get out of the Phoenix summer heat! I understand you Bergie. Our PC is our first fully self-contained motor home. I had a little anxiety with it all until I started the hands-on experience. It is NOT hard at all. I would call the factory. They may be able to mail or email you a copy of the owners manual. My 2007 copy is very basic. All it really provided was the peace of mind that I wasn't missing anything. Sanitizing the plumbing in the spring and winterizing the plumbing and waste for cold winter is where it gets serious. But living in a warm Arizona winter, even that is a breeze. The rest is more straight forward and forgiving. I use a little more bleach in the spring than recommended, closer to a half-gallon to a full water tank. It takes some good flushing and a few days of use before the chlorine smell is near gone. We mostly drink bottled water anyway. Smelling like a swimming pool after the first or maybe second shower is easily tollerated. Better safe than sorry. Most people place the garbage can under the sink in that cabinet. But we like our coffee maker there as designed so we have a free standing can we place below the fridge in our no-slide 2350. You get a glimps of it in this picture, the stainless steel box behind the dinette bench.